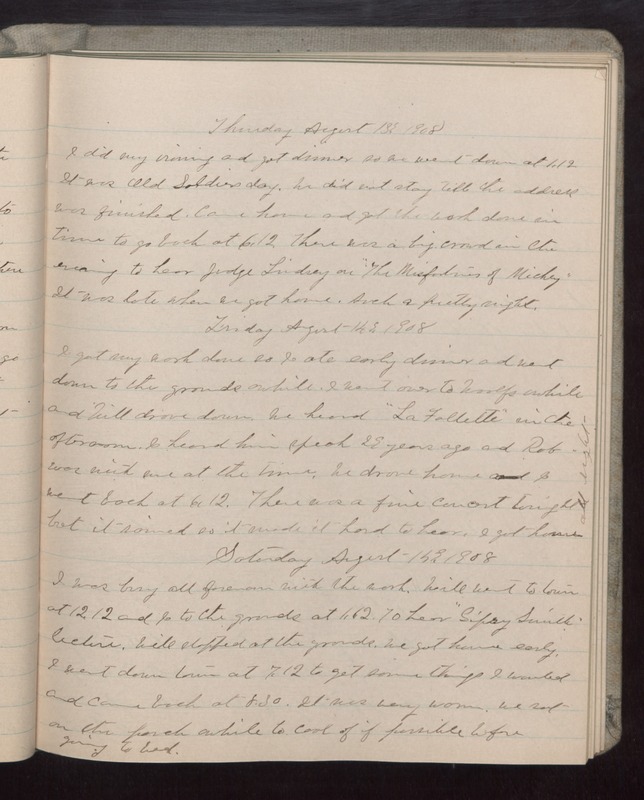 Thursday August 13 1908 I did my ironing and got dinner so we went down at 1.12 It was Old Soldiers day. We did not stay till the address was finished. Came home and get the work done in time to go back at 6.12. There was a big crowd in the evening to hear Judge Lindsey on "The Misfortunes of Mickey" It was late when we got home. Such a pretty night. Friday August 14 1908 I got my work done so I ate early dinner and went down to the grounds awhile. I went over to Woolfs awhile and Will drove down. We heard "La [Fallette"?] in the afternoon. I heard him speak 29 years ago and Rob was with me at the time. We drove home I went back at 6.12. There was a fine concert tonight but it rained so it made it hard to hear. I got home all right. Saturday August 15 1908 I was busy all forenoon with the work. Will went to town at 12.12 and I to the grounds at 1.12 to hear "[Gipay?] Smith" lecture. Will stopped at the grounds. We got home early. I went down town at 7.12 to get some things I wanted and came back at 8.30. It was very warm. We sat on the porch awhile to cool of if possible before going to bed.